Electromagnetic Relay, SPDT, coil 5VDC, 250VAC/6A Electromechanical relay with coil voltage 5 VDC and contact system SPDT. Relay electromagnetic R15, coil 12VDC, 220VAC/10A, 3PDT - 3NO+3NC Universal electromagnetic relay R15 with coil voltage 12VDC, capacity of the contacts 220 VAC / 10 A and contact configuration 3PDT - 3NO +3 NC. Relay electromagnetic R15, coil 24VDC, 220VAC/10A, 4PDT 4NO +4NC Electromagnetic universal relay R15 with coil voltage 24 VDC, load capacity 220 VAC / 10 A and configuration of contacts 4PDT 4NO+4NC. List Price 7.50лв. VAT Incl. 7.12лв. VAT Incl. 6.74лв. VAT Incl. 6.36лв. VAT Incl. 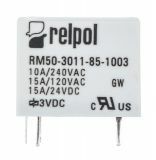 Relay electromagnetic RM50-3011-85-1003, coil 3VDC, 240VAC/10A, SPDT Universal electromagnetic relay RM50-3011-85-1003 with coil voltage 3 VDC and contact capacity 10 A / 240 VAC. Electromagnetic Relay, R40N-3011-85-5024, coil 24VAC 250VAC/40A 1NO+1NC Universal electromechanical relay R40N-3011-85-5024 with rated coil voltage 24 VAC, contact system 1NO+1NC and contacts load capacity 40 A / 250 VAC.